Want to get started in investing, but don’t have the capitol or know how? Mylo is an app that can help! One of the oldest adages when it comes to saving money and acquiring wealth, is to pay yourself first. This simply means that whenever money comes in, you allocated a portion of it to a savings account. Every time you do this, your net worth increases and your future self will thank you. Of course the simplicity of this concept is overshadowed by the complexity of life. There are so many things than can come in the way of paying yourself first Living paycheck to paycheck, an unexpected big expense, or even simply forgetting, can all be obstacles to saving for the future. For those of us who have may not have the greatest memory, or who like to automate their life, Mylo is a perfect solution for building up savings. Mylo is an easy to use app that rounds up the purchases you make and deposits the money into an investment account. For example, if you buy a cup of coffee for $1.49, Mylo will round up the total to $2 and put the extra $0.51 into an investment account. Each Monday, Mylo will tally up all of the round ups from the previous week and withdraw the amount from your connected bank account and deposit the total into your investment account. That’s it. It’s super easy and hands off for you! Mylo takes care of everything! When you are setting up your account, you can choose between a TFSA, RRSP (only available with Mylo Advantage) or a non-registered account. The choice of account will depend on your investment goals and current investment plan. 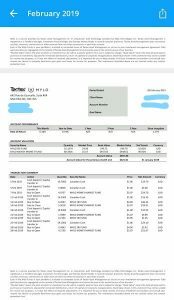 Since I already have a TFSA and RRSP through other means, I use my Mylo investments for short term saving goals and have it set as a non-registered account. Remember that with a TFSA, you are taxed on the money going in, but not when you take it and the earnings out. You also have limited contribution room each year. With a RRSP, you are not taxed on the money going in, but are taxed on the income when it comes out. 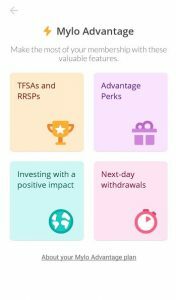 This is a super basic explanation of the difference between TFSAs and RRSPs, but the key differential. One of the greatest things about Mylo, is that you do not need any investment knowledge to have an account. The money put aside is not self- directed. Mylo is advised by a registered Canadian portfolio manager at Tactex Asset Management, a subsidiary of Mylo Financial Technologies Inc. that currently manages over $130 million in client assets. This means, that your account is managed by team of portfolio managers. Part of the account set-up process is a quick questionnaire that gets to know you as an investor. It helps your portfolio manager understand your financial situation, your risk profile and your financial goals. This tool helps the Mylo team make sure they invest your money in a way that you will be comfortable with. Whether you are saving for a rainy day, post-secondary plans or a fabulous trip, having a savings goal is paramount to success. Knowing that money is going to something you really want helps you stick to your plan and celebrate your success. When you set up your account, Mylo will ask you to set your savings goals. You can choose how many goals you want to have and determine the percentage of each round up that is allocated to each goal. You also determine the goal amount. Want a new pair of $300 shoes? Set a custom goal for $300 shoes. Planning a $1500 trip to the Dominican? Set a ‘Go on an Adventure’ goal for $1500. Then watch as your goal meter grows each week! One of the best features of the goal setting is that you can see how much money has been accumulated towards each goal. This great visual keeps you motivated and excited for Mylo gives you the option of creating a custom goal, or choosing from one of the popular goals of: charitable giving, saving for retirement, an emergency fund or to go on an adventure. After reviewing your ‘Know the Client’ questionnaire that establishes your investment personality, your portfolio manager will recommend an investment strategy that will best work for you. Your result will be one of five diversified portfolios comprised of a mix of stocks, bonds and savings funds, suited to your personal goals ranked from Conservative to Aggressive (you can view the full list, along with the stocks that make up the ETF here). The money that your account generates will depend on the type of portfolio that you register for. Like with any investing endeavour, your principal and gains are not guaranteed, which means that you can lose money when stock prices go down. Mylo lets you monitor your portfolio’s performance with monthly statements that are sent out each month. These statements show how your portfolio has performed overtime and will tell you the book value (the amount you invested) and the market value (what your account is currently worth). You can figure out how much you’ve earned on the account by subtracting the book value from the market value. Of course, the stock market is always changing and thus so is your account’s value. There are two account types that you can chose from with Mylo: Mylo and Mylo Advantage. Mylo is just the investment account. This account withdraws your roundups and invests them for you, putting your money into a savings account. The basic account is $1 / month. The second account, Mylo Advantage, is an upgraded account. Like the basic account, it withdraws your roundups and invests them for you, but it also comes with extras. If you want to put your roundups into a TFSA or RRSP, you will need the Mylo Advantage account. With this account, you are also eligible for next-day withdrawals and various perks and rewards. This account is $3/month. 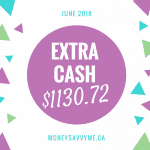 I have been a member of Mylo Advantage since it first launched several months ago, and at the time of posting, a new reward is made available each month. So far, one month it was $5 off of Uber, another was $5 off of Amazon.ca and this month is $5 off of Shoppers Drugmart. So if these are services that you use, you get your money back and then some! In addition to the monthly Mylo account fees, there are also third party management fees that range from between 0.05% and 0.37% of the amounts invested for regular portfolios and between 0.20% and 0.60% for socially responsible investing portfolios. The amount of the third party fees will be determined by your investment portfolio. Once you have achieved your savings goal, or even when you’re just ready to access your money, withdrawing from Mylo is easy. Unless you are a Mylo Advantage member, withdraws are processed on Fridays, so depending on which day you request your withdraw, it can take 2-8 business days for your money to be deposited into your funding source. One of the benefits of Mylo Advantage is the next day withdrawals. So if you choose to enroll in that program, your withdrawal request will processed within one business day. You can withdraw at any time, regardless of your account balance amount and there are never any fees to withdraw. That being said, it is important to remember that the value deposited into your chosen funding source will be determined by it’s market value at the time of withdrawal. Thus it may be more or less than you anticipate depending on the stocks’ value. Not only does Mylo invest your money to earn you more, but they also offer a very generous referral bonus. 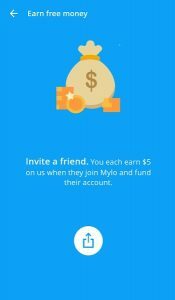 When someone uses your referral link to join Mylo, both you and that person get $5 added to your accounts! This is a great way to boost your savings and help you achieve your goals faster! 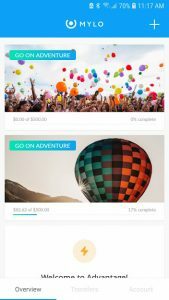 Mylo is a great app for helping you save. I love that it is so hands off and automatic. Once you set up your initial account and complete the paperwork, there is nothing left to do. Each Monday, Mylo rounds up all of the purchases you’ve made on whichever accounts you decide to include and then deposits them into your investment account. Then you watch your savings grow until you are ready to withdraw them. Simply clicking on the withdraw link, and following the easy instructions will initiate the transfer of your portfolio’s funds into the funding source you’ve chosen. If you’re a Mylo Advantage member, you get great bonuses and perks. Each month you’ll be notified of the perk via email. Simply click on the accept button and you’re ready to go! If it’s a cash back for shopping bonus, make sure you’ve activated the bonus via the email, then simply shop at the store using one of your linked accounts. 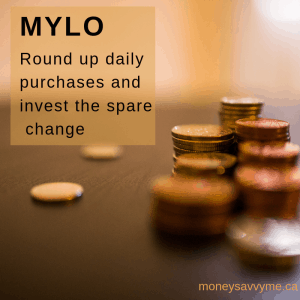 Mylo will then add the bonus to your savings account the following month. You can earn more money by referring others to this great program. Not only do you get a bonus, but so do they! And, you both start an easy, automatic investing journey! You can boost your savings with recurring deposits into your account or one time deposits, in addition to your round ups! Accelerate your time line by saving more! Ready to open your Mylo account? Click here to use my referral link and get your account started with a $5 bonus!